Newts and Salamanders have a long slender body with a long tail and typically four legs. They look very similar to lizards, but remember; lizards have scales and are reptiles. Newts and Salamanders will be smooth skinned and are amphibians. Some salamanders will spend their entire life in water; others spend their entire life on land. Newts spend most of their lives on land but return to the water to breed. Range: Mexico (Lake Xochimilco) Axolotls are found in only 2 high-altitude lakes in Mexico. Habitat: Wetland, Clear lakes with abundant aquatic vegetation. 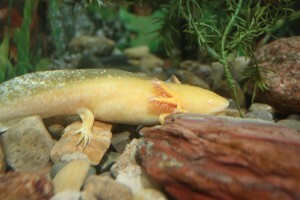 The Axolotl can be found in the Herpaquarium at Scovill Zoo. They can grow up to 11 inches long. In the wild they will eat aquatic earthworms, insects, crustaceans, and small fish. Here at the zoo we feed them earthworms and small pieces of fish. They can live 10-12 years in captivity. They have lived as long as 25 years. Axolotls, like most other salamanders, exhibit internal fertilization. However, there is no copulation. Instead, the male, recognizable by his swollen cloaca, swims around the female. He then deposits a spermatophore on a smooth rock. The female follows the male and picks up the spermatophore, storing it in her cloaca. The 300-1100 eggs, laid the following night, are often attached to aquatic plants. Reproduction is controlled by a combination of day length and water temperature. Axolotls usually breed from December to June. Courtship and spawning take place at night. The young axolotls hatch in about 2 weeks. Like other larval salamanders, they have gills and a tail, but no legs. The front legs appear about two weeks after hatching. The back legs appear 2-3 weeks later. The young then look like miniatures of the adults. Axolotls are closely related to the North American tiger salamander, Ambystoma tigrinum. The tiger salamander begins life as a gilled, aquatic larva. Within a year, the larva metamorphoses, or changes into a land-living adult. It loses its gills, develops lungs, and grows legs. In contrast, the axolotl exhibits neoteny, a condition in which the larvae reproduce without reaching the adult form. Axolotls grow legs and develop rudimentary lungs, but they retain their gills and stay in water. Only certain strains of axolotls transform into terrestrial adults. Some can be caused to change by injecting thyroid hormones into the axolotl. Other strains never metamorphose, instead always reproducing as neotenic salamanders. The North American mudpuppy is similar in its development and reproduction. Young axolotls have strong regenerative abilities. If the tail, a limb, or part of the gills is damaged or removed, they are soon replaced. A leg can be regenerated in 2-3 months. Regeneration is much slower in adult axolotls, and it doesn’t occur at all in metamorphosed ones. Axolotls use their feathery gills for respiration, taking oxygen directly from the water. In axolotls living in oxygen-poor waters, the gills grow larger to take in more oxygen. The gills have a rich blood supply flowing through them. In albino forms, the blood colors the gills red. The thin skin of the body also allows for gas exchange. Large axolotls have rudimentary lungs as well, and they gulp air at the surface of the water. Wild axolotls are nocturnal, finding their prey with their sense of smell and the lateral line. The lateral line detects changes in water pressure and movement of nearby animals. Axolotls feed by sucking in their prey and swallowing it in large gulps. Their teeth are very fine, but the jaws are strong. Axolotls have long been eaten by the people of Mexico. More recently, they have become popular laboratory animals and pets. Wild axolotls are olive green or grayish brown. Several mutations have resulted in a wide variety of color characteristics in captivity. Albinos, white except for the eyes and a few lightly pigmented areas near the head, are very common. Mottled forms also exist. Freytag, G. E. 1968. Modern Amphibians. In: Grzimek’s Animal Life Encyclopedia, Vol. 5. B. Grzimek, ed. Van Nostrand Reinhold Company, New York. Scott, Peter W. 1981. Axolotls. T. F. H. Publications, Inc. Ltd. Neptune, NJ.